Well this is certainly not the Monday I had planned in my mind. The storms just keep a comin' and the rains keep comin' down, but good. We are extremely lucky in our home, we are on high ground and a newishly built house built well, etc... Others in our city are not so lucky. Much damage has struck all around, flooding, lightning striking trees, crashing down on homes, and even office buildings, knocking bricks to the ground below. Mother Nature is taking a tole on people here in our city, and we have now been declared in a state of Emergency. One of our water treatment plants is under water, and an advisory has been sent out to control 'flushing' unnecessarily :( Now that's really not good!!! My post will be short here to day, as I also have a friend who lost her father yesterday and I am going to bake and deliver some things for the family. So sad this Monday is. My pansy are a little worse for wear but looking at the big picture very lucky to be alive. Our very back part of our yard, has no where for the water to go anymore. Our ground is soaked to the max!! With multiple days of heavy raining this is how it goes. No drainage there any longer. One of the rural roads washed away close to the city. Mud Lake Road. 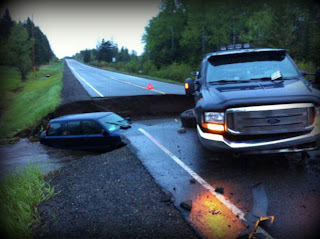 Tragic accident on Oliver Road, major wash out. 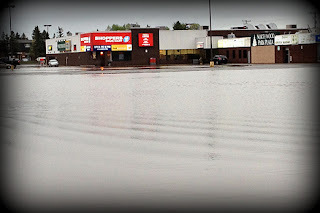 Northwood Mall parking lot and mall building a bit under water. 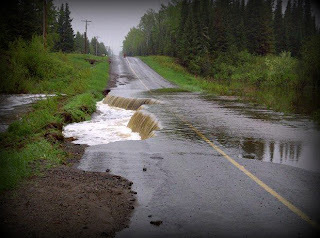 Basements are flooded, people are without there homes, road closures everywhere, my kids are home today due to rural school closures, and unsafe road conditions. Fingers crossed that the rain stops and the sun comes out a shining. 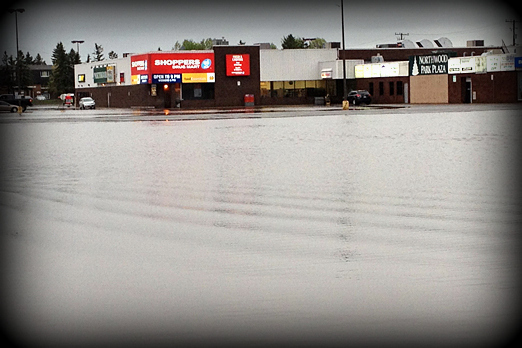 The rain can move on and help out neighbouring towns and cities that are dry and being ravaged by forest fires. Thanks for stopping by today and prayers to all who have damage from the rains, and forest fires. From one extreme to the other, just doesn't seem fair sometimes.